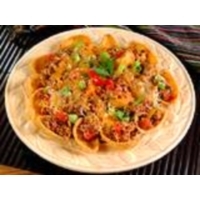 This appetizer recipe is perfect for when you are in the mood for Mexican flavors. Using ground turkey instead of beef, this traditional snack takes on a healthier look. Bold flavors from the salsa, green chiles and onions will really wake up your taste buds. 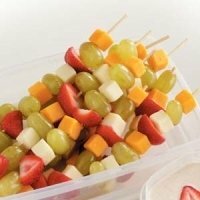 This one is higher in fats, calories and points than many of the other appetizer recipes so be sure to save your points and calories to indulge in this snack for your next party. This appetizer recipe serving size is large enough to make it a meal. With crunchy low fat tortilla topped with ground turkey and cheese makes a snack or appetizer for when the gang unexpectedly drops over. You can use mild or hot salsa depending on your taste. If you really want to spice this up, try adding some jalapeño peppers....but have some water handy as this will really fire up the taste. Combine ground turkey, salsa, chiles and green onions in medium skillet; cook for 5 minutes over medium heat until hot. Cook until meat is browned and flavors are blended together. Place corn chips on dinner plates. Scoop style chips work the best but just look for the whole wheat kind. Fill chips (or top chips) with meat mixture and cheese. Optional: To melt the cheese, place in the microwave for about 15 - 30 seconds. The nutrition facts shown below for this appetizer recipe are per serving. The number of serving is noted in the header section below. The serving size is the first item noted on the nutrition facts table. The ground turkey and veggies were not included in the calculation for the SmartPoints. The veggies were not included when calculating all other points values. Top these nachos with lots of tomatoes, lettuce and onions to give it even more flavor. If you want to save on some calories and carbohydrates, skip the tortilla chips and sprinkle a few tortilla strips (for crunch) on top of the meat mixture. Or skip the chips all together and really reduce the carbs in this snack recipe. Try this appetizer recipe for a Cherry Salsa to use with your nachos. The blend of spices and the sweet and tartness of the cherries really give this lots of fun flavors. 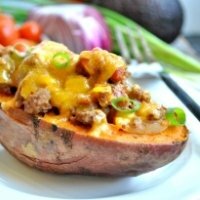 Here's another healthy nacho recipe I found from Hungry girl. For even more Mexican flavors try this appetizer recipe. These are not your ordinary potato skins. 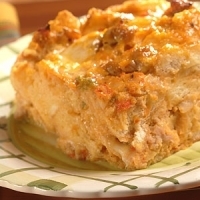 Make your day a taste around the world and try this Italian flavored casserole for breakfast or brunch. 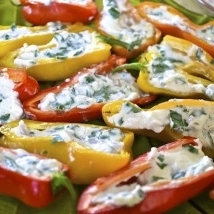 This appetizer recipe is not only fun to eat, they are fun to make. 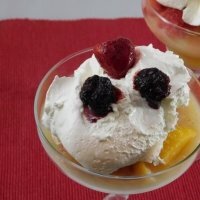 Have the whole family help prepare these. By using ground turkey you are reducing fats and calories for this burger stuffed with delicious flavors. With only 1 FreeStyle SmartPoint, this is one dessert you can always make room for. Add some of these foods to your next recipe or meal. These have natural vitamins and minerals that rev up your metabolism to burn more calories. Use these example workouts to help you lose weight today. These examples will get your heart pumping and build up your lean muscle mass for maximum weight loss. Find out how many calories you need to consume to lose 1 - 2 pounds per week. This calculator will even estimate how long it will take to reach your goals.